Getting steep on Sent. Benini, going across top of cliff 2/3 way up. 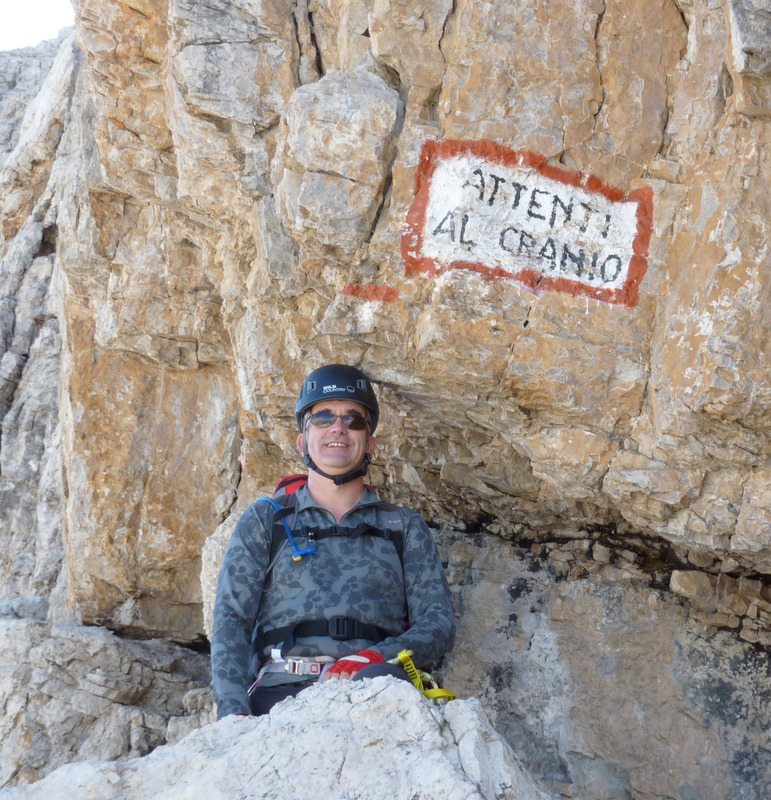 This September Mike and I set off on the Via delle Bocchette, the series of Via Ferrata’s across and around the peaks of the Brenta Dolomites. 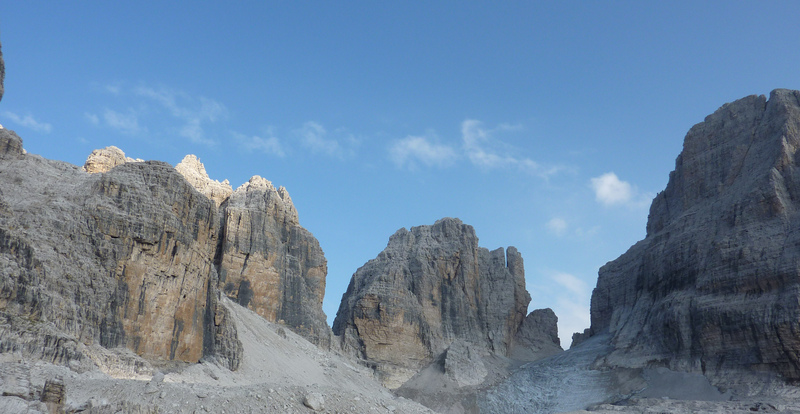 Other areas of the Dolomites are usually ascended as single routes, returning to valley bases each day. In the Brenta, the Sentiero is a high level route across the mountains, occasionally dropping down to passes, (Bocca) usually around 2,400m to 2,700m from where a short detour to a Refuge for the night is taken. This means most people will do the route over 3 to 5 days, and it becomes a social event as everybody meets up in the refuges in the afternoon after following the same and usually, only high level route. We drove from Venice airport to Madonna di Campiglio, the new ski resort, stayed the night ready for an early start leaving the car by the friendly hotel. A quick way of grabbing height was gratefully taken, taking a lift up the Groste gondola to Passo del Groste. As the first part of the Sentiero was scheduled to take only 4 hours we took a side trip up the first section of Pietra Granda, along path 390. It was probably a stretch too far, as we had to have a beer at the lift top refuge on the way back to start of the afternoons route. This was a relatively gentle start, making its way across limestone slabs, gaining height up to 2,859m before the protection started, and then winding its way along level ledges above steep drops and scree. The day took longer than expected and so dropped down to the Refuge Tuckett via the Sentiero delle Gicomo, protected path 315, over the remains of the glacier di Vallesinell Superior, a short steep section across a wall and straight to the Refuge. This was a busy place, all the tables outside full with groups just arrived for the evening and enjoying the view up to the Bocca del Tuckett. That night we were treated to a great sunset, with vertical sunrays shooting up into the sky. We were also treated to some loud Germanic and Irish snoring in the dorm, ahh well. Shocked by the early start in the refuge, we set off with the sun-rise, back along the 315, to where we left the evening, picking up the last few hundred metres of the Benini. This was worth doing as there were more exposed ledges, along with ladders and stemples across to the Bocca del Tuckett. 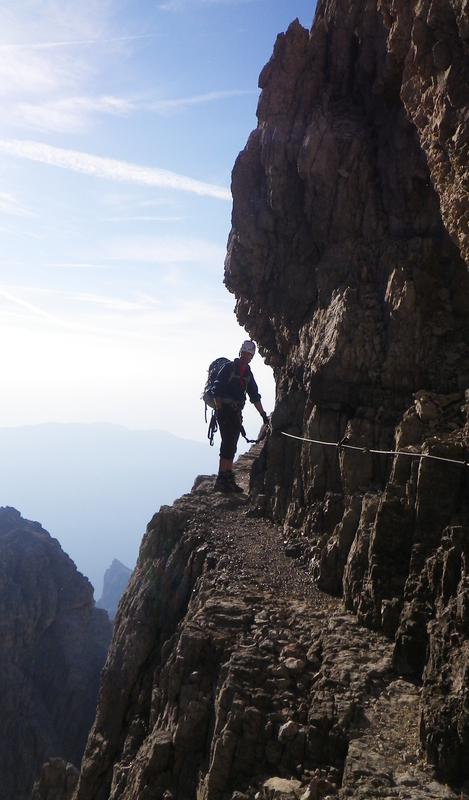 Here we picked up the Ferrata delle Alte, scrambling up a rib for 300m to 2,900m, where an exposed and narrow ledge traversed around the Cima Brenta. The drop is tremendous, around 2,000m to Molveno village and lake below, the lake glowing a luminous blue. A little congestion was met at the only really tricky section as the route moved into a high level gully, where crawling under a bulge, crossing a scree drop, with loose wire and up and down a vertical wall was shared with a few others coming the opposite direction. This section finished off on a flat rib, with drops on two sides, and a top around 3 metres across. Lunch was had here, our high point of the trip, 2,999m, shame about the last metre. We explored a flatter section and followed the red markers around the edge to a vertical rib, with extreme exposure but moderate scrambling, some unprotected, down into a gap at the bottom of the “Ladder of Friends”. Crux section on Bocchette Alte, see climbers descending across unprotected rib after high level traverse behind. Up this to another Bocca and around a corner leading to a split in the path, half way up a cliff. 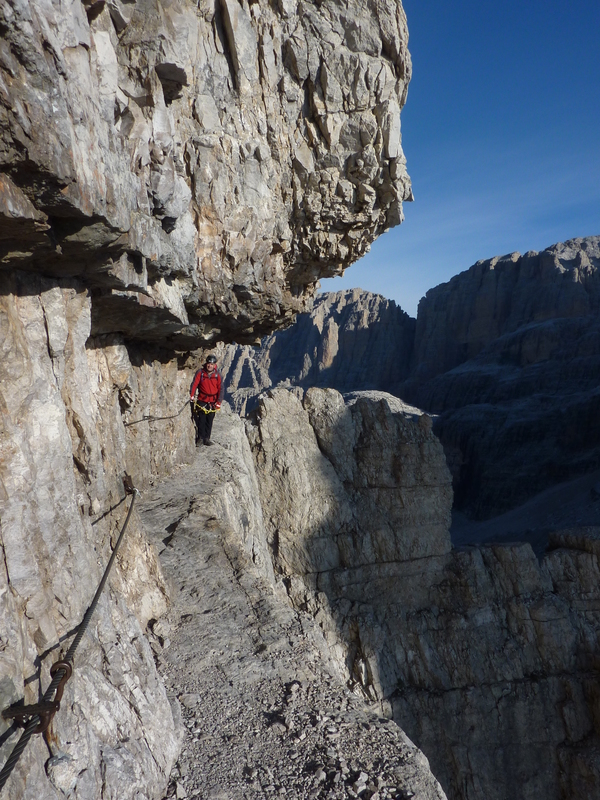 We decided to continue on the Bocchette Alta, rather than a recommended route down the Ferrata Detassi. 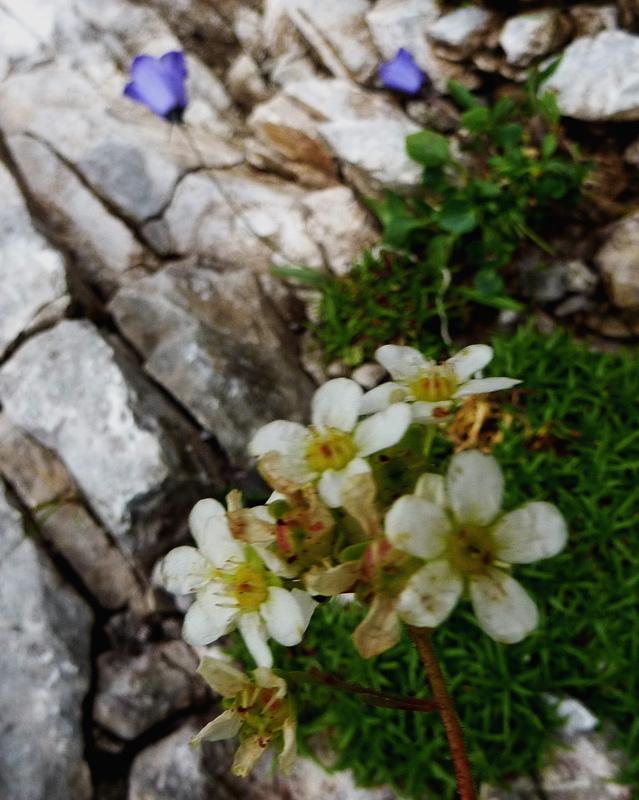 We traversed right across a very thin ledge to a narrow gap the Bocch bassa dei Massodi, which looked as though it had just lost its last snow, with 1,000m drops either side. This was a good choice, as the exposure continued and took us around to the west side of the range and a good view down to the Refuge below. We contoured around a face and picked up the path from the bottom of the glacier down to the Rifugio Alimonta. Another great view, a crowd of fellow travelers and a beer awaited us. A long and adventurous day, one of the best eve; rounded off with hot showers. Day 3 Ferrata del Bocchette Central and Sentierio Brentari to Rifugio Agostini. A good night and so an early start back up the glacier to the Bocca dei Armi. The glacier was not steep and passable without aid, although a pair of walking crampons helped. A ladder gained height straight away leading up to a long ledge, wide enough to not worry too much about clipping in, but with a vertical 1,000m drop. After 3 days of this, confidence was at its height and we skipped along this superb route. Rounding the corner just below Cima dei Fulmini, still close to 2,850m up, brought the Campanile Alto and Basso into view, two vertical towers of rock that the path winds its way around. 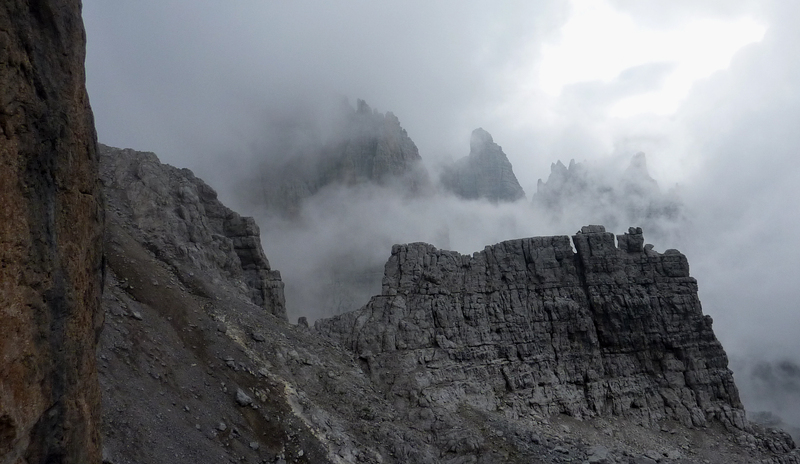 This is apparently where sections of Cliffhanger were filmed, a claim held by many places in the Dolomites. The Basso had climbers up the face in front of us and around the corner we spotted a solo climber halfway up the Alto. After this superb rock scenery, the route traversed a wall on the west side again, across a narrowing ledge to a rather worn wooden bridge in the ledge. This traversed around the cliff to just below the Bocca di Brenta, and a short walk over to the sunshine and the Rifugio Pedrotti. We had to talk the warden into cooking some pasta for our rather early lunch, we wanted to get off again on the second path of the day. As most people were arriving for lunch we set off again into the area of the old glacier Tosa, path 358 – Sentiero Brentari. 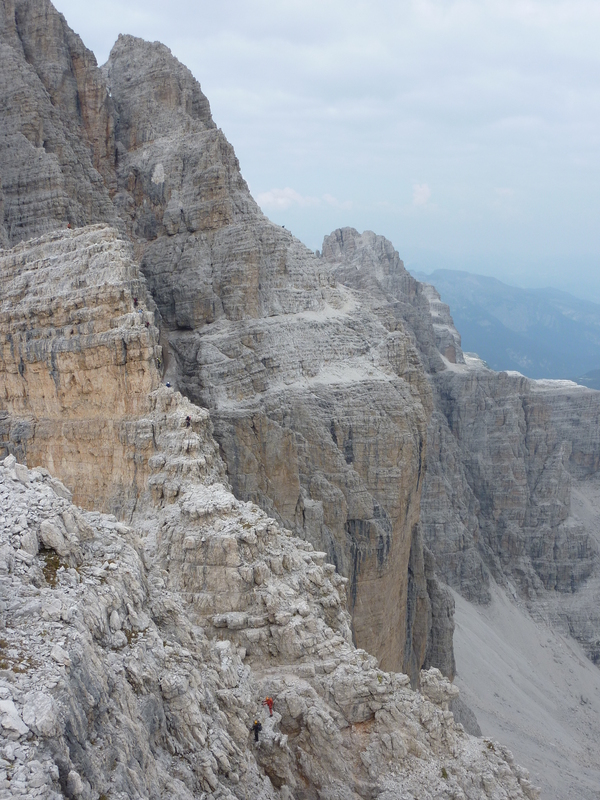 This was one of the first Brenta paths and once crossed the now shrinking glacier. 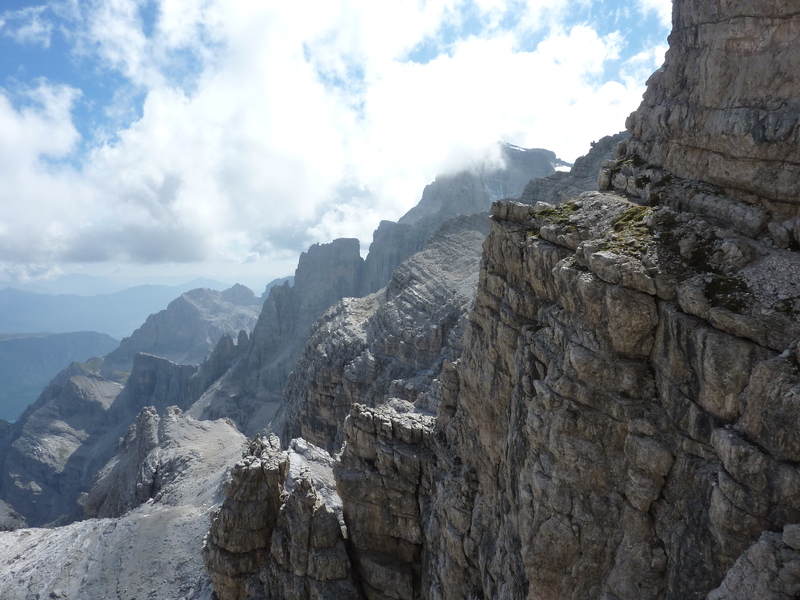 It took us around the east face of Cima Tosa, and across to splendid area with great views back to the Campanile’s. After gearing up we set off down the ferrata, promising a tough finish at 3C. It went well, across some ladders and ledges but as the glacier below got closer, the footholds started to disappear. Another sign on the cliff face showed where the path split, the other going up the glacier to another Bocca and vf. Below the rock got thinner, until I was hanging from the wire, looking for holds, before working out how to use the wire pegs to move across to the top an aluminum ladder, held by rope. The ladder bounced as weight was moved onto it so quickly descending it over the bergschrund was a relief. The ladder had sunk around 2 metres into the ice, leaving a difficult gap at its top and stretching the ropes holding it up. That was some pitch, the following parties also struggled down, arriving beside us with some relief. Crampons and ice axe helped us down the short glacier to its end and the walk down to the Rifugio Silvio Agostini. 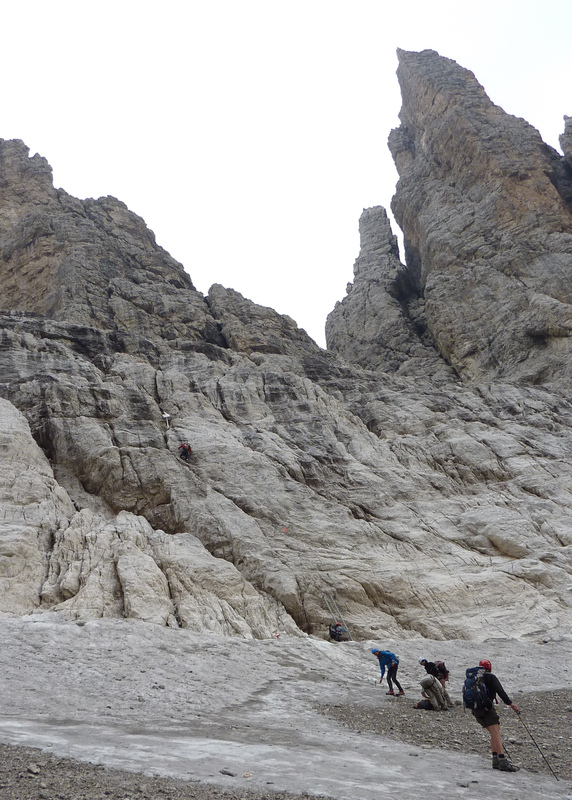 Final Pitch of Sentiero Brentari onto glacier. This refuge is in a lovely location, surrounded on three sides by rock walls, and even has its own footbath – “Kneipp”, with different surfaces, and very cold water. Good for the circulation in the weary feet apparently. During the last couple of nights we had been tracking the weather, which until now had been warm, dry and generally cloud free, although a cooler wind had started as we had lunch. Clouds had bubbled up during the day, not threatening, nor affecting our views, but they were there. 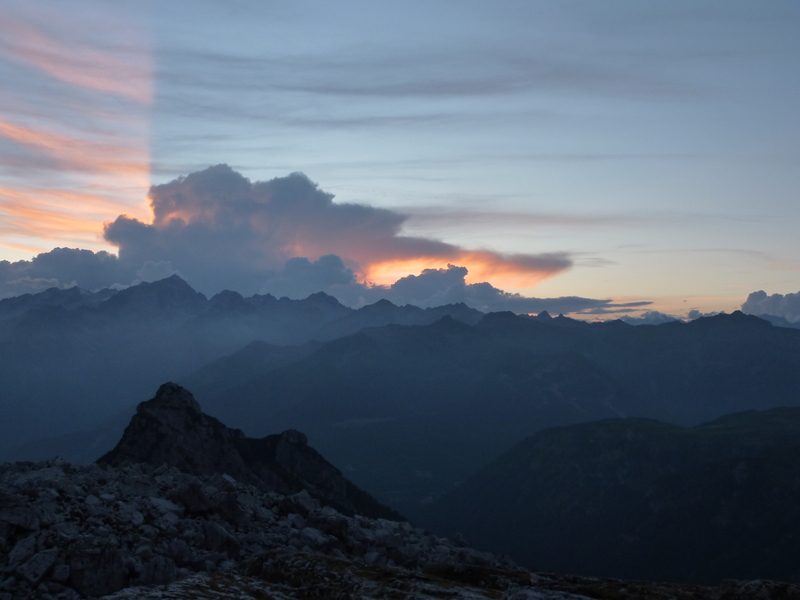 The refuge wardens had all said that our next day, Wednesday – our last in the Brenta, would have bad weather, so tonight we took care to work out when the rain would come. Forecasts said it would start raining mid-morning, which gave us time to get over the last via ferrata in the walk and down into the valley before we started to get wet. Still, it would make for a long trudge back to the car in the rain, but the alternative was a difficult walk out in the wrong direction entirely, or an extra night in the hut. First up in the refuge, quick breakfast and away. We were in the mist, but it wasn’t raining. We reached the bottom of the first ladder in 30 minutes, good going. The route took us to a vertical wall, and with another 250m to go to the top of the ridge above us, we knew there was interest to come. What we had was 13 ladders, some overhanging, others with tricky finishes plus another wooden bridge over a long drop. Some of the gullies were filled with lavish and strange plants, but as we raced to the top I didn’t have time to figure out what they were. We reached the Bocch dei due Denti at 2,859m in 40 minutes, we were really steaming as we entered the small gap and looked down into another bleak valley and the Rif, XII Apostoli below us. Surprisingly ahead of us were the guided pair of Germans we had tracked for 4 days, they must had left without breakfast! Soon we were there having our own second breakfast, relieved to be across the ridge before the storm came. So without really looking forward to the 10km walk back to Madonna di Campiglio, we took the scenic protected path 307 (Scala Santa) down. Then it started raining, with thunder rattling around us, the limestone and tree roots becoming slippy. We picked up route 324 – signposted Madonna, down to the small lake. Just beyond there we hit the forest track road-head and found a car parked. A man was putting stuff into the boot of his car, so we stopped to say “Ciao” and ask if we were on the right road. After he worked out what we were saying he offered us a lift to the main road, great. He was a hunter and had a shot deer in his boot, and a rifle on the back seat. Soon we were at the road half way between Pinzolo and Madonna and on the bus back to the car. What a stroke of luck. We drove across to Corvara for the second part of our trip, and to meet up with friends on their way driving from Kent. Just found you write up of your trip to the Brenta. 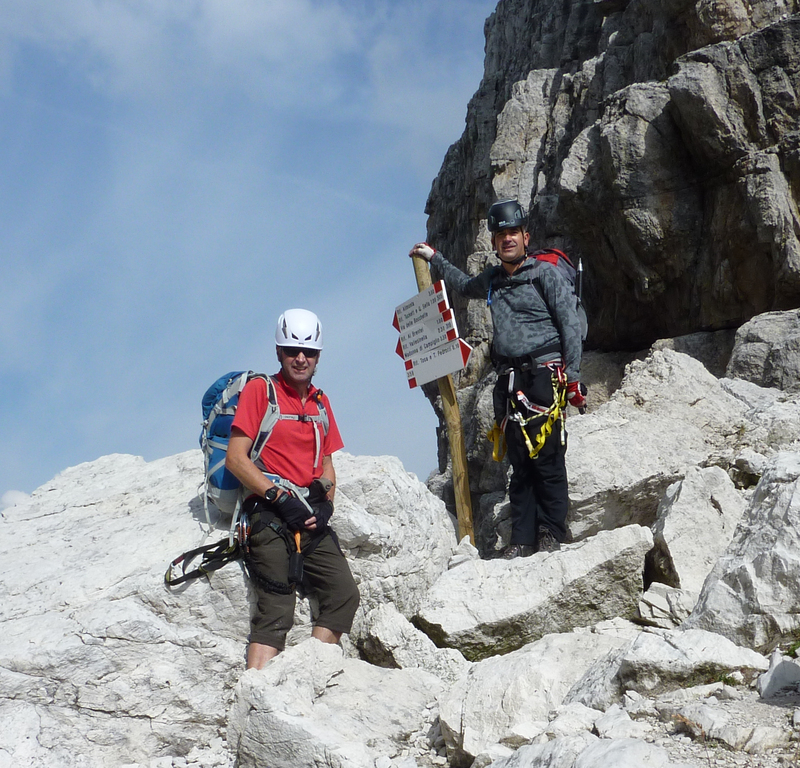 Glad you enjoyed the traverse of the Brenta Dolomites as much as I did when I did it with some friends. It is truly world class – there is no where else you could possilby do such a wonderful expedition. 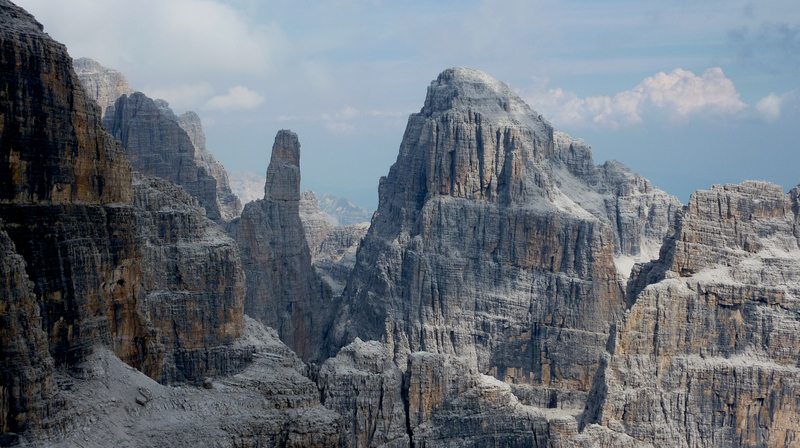 Have you any more plans in the Dolomites or beyond. I have just got back from a wonderful walk along the John Muir Trail in the states ( see http://bigwalksclub.co.uk/ for details) and will be back to the Dolomites next year to finish off all the significant Via Feratas. Thanks David. Dolomite plans for this year had to be ditched due to too many other expeditions. No doubt back soon, perhaps AV2 and Tofana to repeat some I did a long time ago. 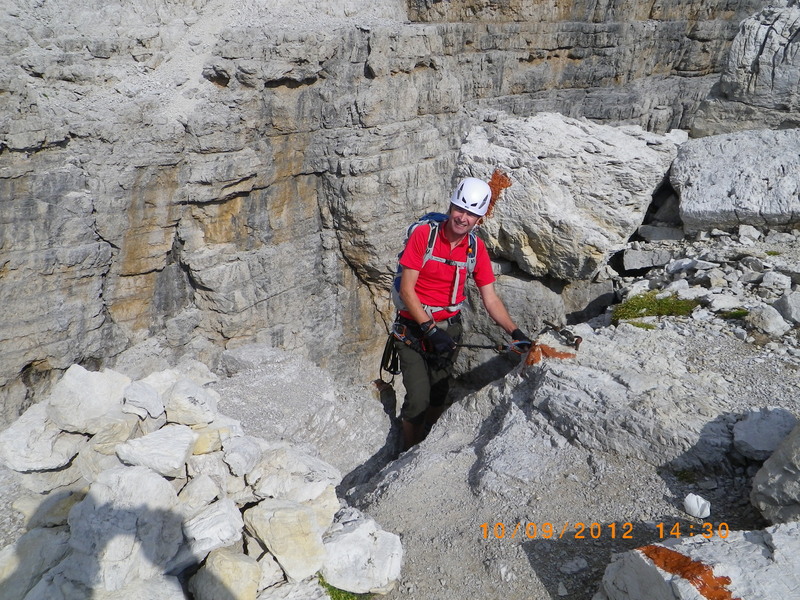 This entry was posted on September 27, 2012 by antondotreks in Blog, Dolomites, Expeditions, Mountain Leader and tagged Brenta, Dolomites, Via Ferrata.